We have relationships with some of the finest companies and wholesale insurance brokerage firms offering Big Rig & Commercial Truck Insurance coverage’s. National Insurers has access to the finest companies and wholesale brokerage firms offering Semi Commercial Truck insurance coverage’s for you in FL,GA,IA,IN,KS,MD,NC,NE,NJ,OH,PA,SC or VA .
Primary Liability: State or Federally Mandated liability insurance coverage protects you lawsuits from injury or damage to others. Big Rig Truck Physical Damage: Protection covering the repair or replacement of the truck or trailer (Comp & Coll). Motor Truck Cargo: Protection for the operators/company or transporter for his responsibility in the event of damaged or lost freight. Many other coverage options are also available depending on the state and available companies offering policies in your state. Feel free to discuss all of your options with one of our experienced commercial trucking brokers who will be glad to assist and advise you. Submit your information below and let our truck specialists work up some outstanding Commercial Truck Insurance coverage’s for you if your business is located in FL,GA,IA,IN,KS,MD,NC,NE,NJ,OH,PA,SC or VA call us at 877-294-0741. Contact National Insurers about your Commercial Truck Insurance needs. Please tell us what your are looking for or what we could help with if needed. For any other state use our Insure Big Rig National Insurers online quoting companies (855) 820-8321. We offer the highest quality Commercial Truck Insurance companies available to insure big rig Semi trucks with AIG, Progressive Commercial, Berkshire Hathaway Homestate, Northland, NICO, Canal, Prime Insurance, National Casualty, Plaza, Lancer and National General. 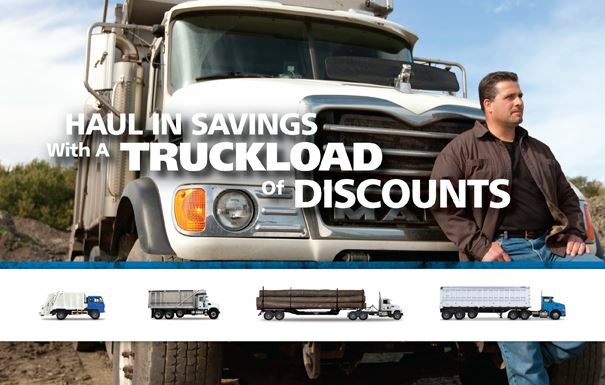 Potential Big Rig Truck Insurance Discounts that may be available. Commercial Driver’s License (CDL) Discount – For-hire truck insurance customers who have had a Commercial Driver’s License (CDL) for at least two years can save on their auto liability coverage. Business Experience Discount – Business auto & commercial truck and tow truck insurance customers in business for more than three years may qualify. Prior Insurance – Your company could be eligible for additional savings if you’ve maintained continuous insurance coverage for the last 12 months. Package Discount – Business Auto & Trucking customers with an in-force General Liability (GL) or Business Owners Policy (BOP) could be eligible. Paid In Full Discount – You can save if you decide to pay your total premium in one lump sum. Many people ask us the question, how can I find commercial insurance near me? We have the services to help you now! Commercial Truck Insurance products underwritten by local and national insurance companies based on selected coverage area. Coverage and policies are subject to underwriting guidelines, review, and approval. Products and discounts not available to all persons in all states. Manufacturer: AIG, Berkshire Hathaway Homestate, Progressive Commercial, Northland, NICO, Canal, Carolina Casualty, National Indemnity, National Casualty, Plaza, Lancer and National General (877) 294-0741.